Miami HEAT NBA Champion Dwyane Wade will host a fashion fundraiser, A Night on the RunWade Sponsored by Carnival and Presented by Neiman Marcus Coral Gables, for his Wade’s World Foundation in Miami on September 26. As part of his ongoing commitment to giving back to the South Florida community, Wade will host a cocktail reception, live entertainment, silent and live auctions, and a fashion show presented by Hublot featuring looks from Neiman Marcus Coral Gables. The event will be will be emceed by fashion correspondent Jill Martin and news anchor Louis Aguirre with music by DJ Irie. Wade’s World Foundation has also teamed up with Miami International University of Art & Design to create a contest where three finalists will be chosen to feature some of their designs in the fashion show. All net proceeds benefit the Wade’s World Foundation and local Miami community organizations. For tickets to A Night on the RunWade, contact Kiley Lapointe at Kiley@agency21consulting.com or 305.529.9506 ext. 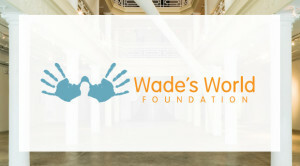 5. www.wadesworldfoundation.org. Fashion + Beauty Fix returns to Hoxton Urban Beach House and sets out to launch their Fall Edition September 26, from 7:00 to 10:00 p.m. The evening will be hosted by Vanessa Gonzalez of Diva Moda Fashion Couture, Maya King of A La Mode Maya, Vique Martinez of Miami.com and Emilio Uribe Celebrity Stylist and Designer and owner of Haus Fashion. Fashion experts, Vanessa Gonzalez & Maya King, will be sharing their Fall Essentials, selecting their favorite picks from Fashion + Beauty Fix vendors. Ladies will then have a chance to shop their favorite brands and fall essentials from Modish Mint, Rebi’s Closet, Bekora, Shibue Couture, Amoura, Lady Lux Boutique, My Bikini Club, Diva Fashion Couture, and more while getting pampered by celebrity manicurist Ingrid Burke and makeup artist Melanie Rodriguez. Nightlife Writer, Vique Martinez will turn up the party making sure every cocktail is party approved! She will be creating the specialty cocktail menu using Little Black Dress Vodka and Hoxton Urban Beach House Mixologist. The night will end with a fashion show at 10:00 p.m. featuring Emilio Uribe’s Fall Collection. Guest are encouraged to stay and enjoy the live entertainment provided by Hoxton after the shopping event. To RSVP visit: http://fashionandbeautyﬁx.eventbrite.com. 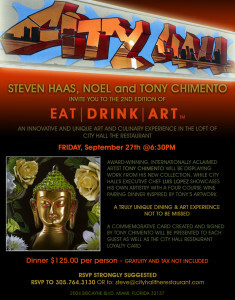 On Friday, September 27 at 6:30 p.m., City Hall The Restaurant, will be hosting internationally acclaimed artist Tony Chimento for a night that will surely be remembered. An exquisite Four Course Dinner and wine pairing will be presented by Chef Luis Lopez inspired by the artist’s Italian heritage. Dinner is priced at $125 per person (excludes tax and gratuity). Reservations are strongly suggested, 305.764.3130. The first annual Cluck Miami, an event celebrating the delectable combination of fried chicken dishes paired with champagne, will be held Friday, September 27, from 7:00 p.m. to 11:00 p.m. in Wynwood Arts District at Studio 255. Proceeds from the event benefit Ronald McDonald House Charities (RMHC) of South Florida, whose mission is to create, find and support programs that directly improve the health and well being of children in South Florida. The fundraising event will showcase local chefs’ individual take on the classic fried chicken dish, culminating in a competition where guests will vote to decide this year’s winning Chef of Cluck Miami. Participating chefs and restaurants include: Miami’s first winner of Food Network’s “Chopped,” Chef Giorgio Rapicavoli with Eating House; Chef Bradley Kilgore with J&G Grill at the St. Regis Bal Harbour; Chef Adrianne Calvo with Chef Adrianne’s Vineyard Restaurant and Wine Bar; Chef Jacob Anaya (formerly of Mandarin Oriental) with OTC Brickell; Chef Jean Paul Desmaison (formerly of La Cofradia) with Jean Paul’s House Restaurant and Market Place; Chef Richard Hales featuring Midtown’s loved Sakaya Kitchen and his new creation, Blackbrick, a new concept in Chinese food set to open this fall. For complete listings, visit www.CluckMiami.com. Pinkberry, a global yogurt retailer, will open its fourth store in South Florida on Friday, September 27. The new store, located in the heart of Miami’s Midtown district, at 3401 N Miami Avenue, will make it easy for Miami residents to try Pinkberry’s one-of-a-kind, handcrafted yogurt experience.To celebrate Pinkberry’s Midtown location, they will host a friends and family event on Thursday, September 26 from 7:00 to 10:00 p.m. where they will be swirling free yogurt for their guests. On Friday, September 27, join Whole Foods Market® – Coral Gables for an elegant three-course Asian-inspired dinner featuring wine pairings by JUSTIN Vineyards & Winery. Beginning at 7:00 p.m. and priced at $30 per person, guests will enjoy a delicious meal with each course paired with an accompanying wine as well as have the opportunity to learn the history behind this wonderful family owned and operated winery. 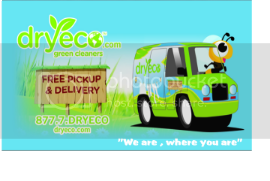 To pre-register, attendees must visit Customer Service and pay the $30 per guest entry fee in order to reserve a seat. No refunds can be given for special event tickets once purchased.